FACP has a long history of 35 years. Before, the FACP was only a friendly craft where friends gather together to share the same passion in music and performing arts. 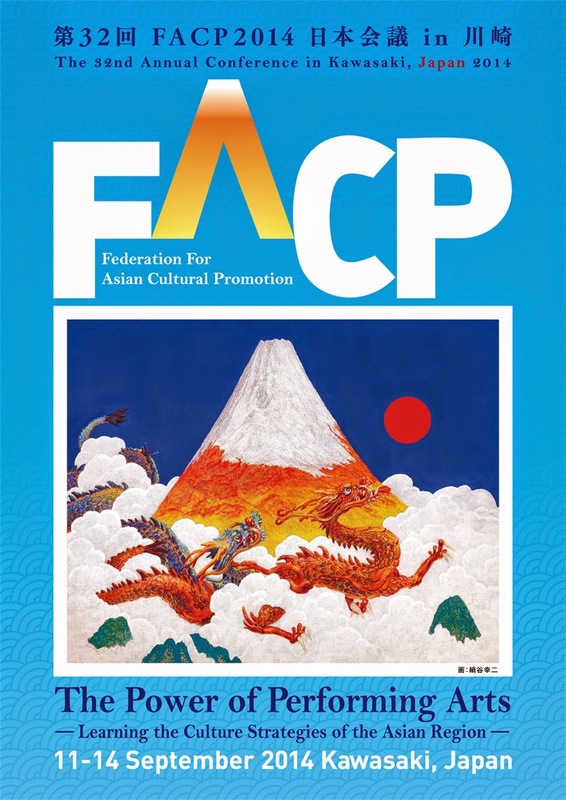 Decades have passed and it is now the time for a change to a new era to accomplish FACP’s goals of cultural exchanges between Asian cities and proposal to the government to increase budget for promoting music and cultural education. The last FACP Conference that was held in Japan was the 13th Conference in 1995 in Kobe. After 19 years, I am very happy that this year’s conference is back here to be held in Kawasaki. A lot of cultural and musical performances have been actively promoted in Japan, which is the ideal venue that reflects this year’s theme of “The Power of Performing Arts. Learning the Culture Strategies of the Asian region.” Subtitle: Social Role and Network Formation of Art Performance in Asia / Japan's Contribution. The keynote speaker for this Conference is Mr. Gareth Malone, who is well-known in the UK, has often been featured on BBC TV, and was highly distinguished by the Order of the British Empire (OBE) for his achievements in music. I would like to make this Conference a productive one as we discuss meaningful topics such as “The Significance of Orchestra Development” and “The World of New Art Developed by 8K-Technology”. I believe that everyone will have a meaningful experience in this Conference. We look forward to your attendance and participation. Conference History is shown on another page. Please take a look. Gareth Malone OBE is a choirmaster and broadcaster who first appeared on TV in the three-part BBC documentary series The Choir in 2006. The series saw Gareth take on the challenge of bringing music into the lives of students who had never sung before and ultimately taking them to compete in the World Choir Games in China. Following on from the success of series two, The Choir: Boys Don’t Sing, Gareth's third series The Choir: Unsung Town saw him attempt to unite the community of South Oxhey near Watford as a choir. After the warm reception and loyal following The Choir programming received, Gareth’s next project took him to Glyndebourne in a hunt for fresh talent to perform in the new opera, Knight Crew, and on to explore how boys are educated in Gareth Malone's Extraordinary School For Boys and building children’s confidence in The Big Performance. The fourth series of The Choir aired in November 2011. In his most emotional challenge to date, The Choir: Military Wives, saw Gareth give a voice to the wives and girlfriends left behind at the Chivenor and Plymouth barracks when troops were deployed to Afghanistan. The hit single from the series, Wherever You Are, was a resounding success, making Christmas number one in 2011, and the choir's album, In My Dreams, went to number one in March 2012. A second album, Stronger Together, was released in November 2012. Also this year Gareth released the official Jubilee song Sing composed by Gary Barlow and performed by The Military Wives Choir. Performing with the Wives at the Queens Jubilee celebration concert made this a special end to a great project. Gareth’s next TV project, Sing While You Work, saw Gareth infiltrate the work place to get four large UK companies singing as choirs, this first aired on BBC2 in September 2012. Due to its success a second bigger series aired November 2013. To date these astoundingly successful series have won two successive BAFTA awards and two RTS awards. Early in 2013 Gareth began a UK-wide hunt with Decca Records to find the country's most talented young singers to form a new youth choir. This culminated in Gareth Malone’s Voices, released 18th November 2013. It sees Gareth return with his most personal album yet, embodying his vision of the future of choral music. Gareth studied singing as a postgraduate at the Royal Academy of Music with Janice Chapman and Jonathan Papp. Gareth has also written two books - Music for the People, an entertaining introduction to classical music, and Choir: Tears, Triumphs and Transformations, a look behind the scenes of The Choir TV series. Professor, Institute of Innovation Research, Hitotsubashi University Academic Director, Centre for Japanese Studies, GIBS, University of Pretoria Professor Yonekura received his B.A.s (in both Social Studies and Economics) and M.A. in Social Studies from Hitotsubashi University, and Ph.D. in History from Harvard University in Cambridge, the United States. He is Chief Editor of Hitotsubashi Business Review. He is also Dean of Nippon Genki Juku, a lifetime education program at Academyhills in Roppongi, Tokyo. His research interests have been focused on the historical development of innovation and entrepreneurship. Currently he is also working on the social innovation in the emerging market. He is a prolific author of numerous titles on a wide range of subjects such as; The Japanese Iron and Steel Industry 1880-1990: Continuity and Discontinuity (Macmillan, 1994), Structure of Business Revolution (Iwanami, 1999), * The Age of Non-Charismatic Leadership (NTT Publishing, 2005), Emergent Destruction -Innovation for Good Future (Mishima-sha, 2011). He loves tennis, golf, and rock’n roll. Since 1971, Masayuki Sekita has been engaged in inviting to Japan the world’s leading performing arts organizations (including the Metropolitan Opera, Bolshoi Ballet and Bavarian Radio Symphony), as well as in carrying out the management of Japanese musicians. He is currently Chairman of Japan Arts Corporation. In addition, as General Director of Japan Music Foundation JESC, he supports the cultivation of musicians and the dissemination of classical music. 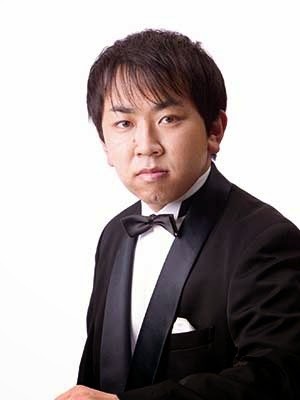 Mr. Sekita is also Chairman of the Japan Association of Classical Music Presenters. Keisuke Murakami graduated from the college of Arts & Sciences from the University of Tokyo. He obtained the degree of the Master of Applied Economics from the University of Michigan. In 1990, he entered the Ministry of International Trade and Industry (MITI) where he contributed the energy policy and the software industry policy. In 2007, he engaged in the start-up of “Cool Japan” strategy as the Director of Media Content Industry Division. Then, he became the Division Director of climate change international negotiations. In 2011, he was appointed as the director of New and Renewable Energy Division from 2011 and he is now working to promote the development of renewable energy, and to contribute the vitalization of domestic local economies through renewable energy business. Khunying Dhipawadee Meksawan Director, Bangkok Symphony Orchestra Foundation Khunying Dhipawadee Meksawan has held many key positions in the government of the Kingdom of Thailand, namely, Minister Attached to the Prime Minister’s Office, and Permanent Secretary of Ministry for Culture, Ministry for Information and Communication. While holding the position of Secretary General of Civil Service Commission, from 1997-2002, she has done an outstanding task for Thailand in the implementation for a major civil service reform. Khunying Dhipawadee Meksawan holds the Master of Public Administration from Harvard University. Presently, she is a member of State Council, Royal Thai Government, President of Thai WomenWatch Association. She is presently involved in charity works as President, Make – A – Wish (Thailand) Foundation, and is active member of the Board of Directors of Bangkok Symphony Orchestra Foundation Khunying Dhipawadee Meksawan was bestowed the decoration “Knight Grand Cordon (Special Class) of the Most Exalted Order of the White Elephant. Assistant Secretary General， China International Culture Association Studied English and American Literature and Cross-Culture Communication at the Beijing University of Foreign Studies; worked as Third and Second Secretary at the Cultural Section of the Chinese Embassy in London; worked as Consul for Cultural Affairs at the Chinese Consulate General in New York and in Toronto; worked as Director of the Administrative Office of China Cultural Centers and as Director of Media and Publicity Division, Bureau of External Cultural Relations, Ministry of Culture, PRC. Former Cambodia's Ambassador to the United Nations, former Minister of Defense, and presently Prince, Minister, and Member of the Privy Council of the Royal Cabinet of His Majesty the King of Cambodia. Chairman and President, CEO, BroadBand Tower, Inc.
Born in Fukuoka, Japan in 1954. He graduated from the Faculty of Science, Kyoto University (Department of Astronomy). Ph.D in Information and Communication Engineering from The University of Tokyo. Having worked for IBM Japan, Hitachi Engineering, ASCII, Dr. Fujiwara carried out research and standardization of the moving picture coding method and participated in the creation of MPEG. In 1996 he established and became the President and CEO of Internet Research Institute, Inc., a research and development institute of the Internet technologies. 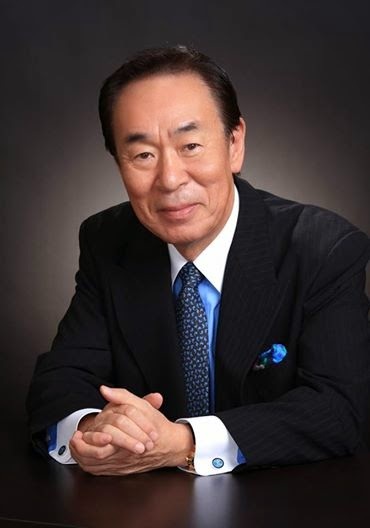 In 2005, Dr. Fujiwara established Nano-Optonics Energy, Inc. as the Chairman of Board of Directors. In 2012, he was appointed to become the Chairman and President, CEO of BroadBand Tower, Inc. He has written many books, including “Science Technology and Entrepreneurship – For The New Industrial Revolution” (Iwanami Shoten, Publishers. ), “The Fourth Industrial Revolution” (Asahi Shimbun Publications Inc.). Dr. Kuroda joined NHK (Japan Broadcasting Corporation) in 1982. From 1985 to 1999, he worked at NHK Science & Technology Research Laboratories (STRL) and engaged in research and development related to FM multiplex broadcasting, digital transmission and transmission system for digital terrestrial television broadcasting (ISDB-T). Since 1999, he worked at Engineering Administration Department and engaged in installation of digital broadcasting. Through Corporate Planning Bureau, he was the head of the Broadcasting Networks Research Division of STRL from 2009, the head of the Planning and Coordination Division of STRL from 2011, the deputy head of STRL from 2012 and has been the head of STRL since 2014. He is responsible for research and development of next-generation television services such as UHDTV (8K Super Hi-Vision) and Hybridcast. He won Hoso Bunka Foundation Award, Ichimura Academic Award (The New Technology Development Foundation) and C&C Prize. CG Artist / Professor of The University of Tokyo. Born in Tanegashima Island. Kawaguchi has been working on Computer Graphics since 1975, and has been recognized as a pioneer and a world-class authority of CG art by his unique style. Using his ‘GROWTH Model’, a Self-Organizing procedural modeling algorithm, he has been creating various artificial complex life forms. Recent work includes development of CG expression of natural beauty based on physical basic model, 8K Ultra High Definition CG art, creation of new traditional art-form incorporating traditional craftsmanship and advanced IT-based expression, creation of artistic and primitive robot for planet exploration, development of ‘Gemotion’(Gene, Growth + emotion) 3D Bumpy display which react emotion like living beings. He won ‘ACM SIGGRAPH Distinguished Artist Award for Lifetime Achievement’ in 2010 for creative and innovative artistry, giving life to a stunning aesthetic derived from his dedicated research in computer technology, biological forms, and contemporary artistic practice. In 2013, He received the Award from the Ministry of Education in the Art Encouragement Prizes and Medal with Purple Ribbon. Hidemi Hyuga entered NHK in 1973. As director/producer and with a focus on science, he produced various documentary TV programs. One of the productions in which he participated was “Chernobyl”, which received Golden Nymph at Monte-Carlo Television Festival in 1986. Hyuga has held the position of Head of Program Production Department, Executive General of Broadcasting as well as General Managing Director. Starting 2011, he is Chairman at NHK Symphony Orchestra. Guo Shan is a Chinese contemporary classical pianist. She is the current president of China Symphony Development Foundation. 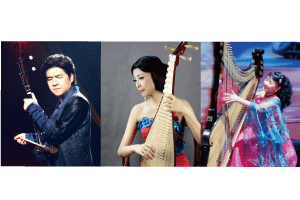 During her career which spans over four decades, she has worked in the China Motion Picture Symphony Orchestra for over 20 years, involving in hundreds of TV series and films, touring often nationwide and abroad with the orchestra. In 2004 she was elected President of China Symphony Development Foundation. Among her initiatives were Charity Concert Devoted to the Sichuan Earthquake Zone for Mothers and Sons in 2008, Youth Soloist (Concerto) Music Competition, Austria Music Tour, Mozart China Piano, Vienna Chinese New Year Concert, Strait Philharmonic Tour, etc. She also founded the League of CSDF consisting of 57 professional orchestra members. She was elected the Chairwoman of the Alliance of Asia-Pacific Region Orchestras (AAPRO）end of 2008 during its sixth Summit. In 2010, initiated by Guo, AAPRO formed the Asia-Pacific United Orchestra and presented a gala concert at the UN Headquarters General Assembly Hall to inaugurate the UN Academic Impact. In August 2012, the APUO made its European debut, touring Bratislava, Vienna, Prague, Tallin and Helsinki. Joyce Chiou has been the Executive Director of Taiwan Philharmonic, the National Symphony Orchestra in Taiwan since 2006 and one of the General Committee Members of the Alliance of Asia-Pacific Region Orchestra (AAPRO) since 2009. Following her musical training in Taiwan, Joyce Chiou received her master degrees in music and drama from the University of Illinois and Northern Illinois University in the U.S. She has produced/ directed for more than two dozens of operas for the Taiwan Philharmonic, the Taipei Arts Festival and the Taiwan Music Festival since 1990’s. As a playwright, Ms. Chiou’s work includes Opera: Heart Sutra (in English, based on Eileen Chang’s short story, 2012), and The Black Bearded Bible Man (in English & Taiwanese, 2010), and the Chinese musicals: The Fantasticks, and Women Needs Love, Not To Be Understood. Joyce is also active in theatre circles; she was the producer of the International Stage-reading Festival in Taiwan in 2004 and 2005. Her writings include books A Beautiful Mistake--Biography of Lee, Tai-Shan, Praised for Passion, Lived Without Regrets--Biography of Lee, Yung- Kang, From West End to Broadway, Show Time! – 9 Styles of Musicals and Behind the Mask—Phantom of the Opera. Malou Jacob is a playwright and founding president of Women Playwrights International Philippines ( WPIPHIL). Among her most known and produced stage plays are Juan Tamban on street children; Anatomiya ng Korupsyon, a satire on a juvenile and domestic court; PEPE, a monologue on Filipino hero, Jose Rizal; Macli-ing on the Cordilleran struggle against the Chico Dam. She is a SeaWrite and Gawad CCP para sa Sining Awardee. As playwright, she was Philippine delegate and paper presentor in conferences of Asian PEN in Tokyo ( Asian Feminist Aesthetics) and Bali ( In the Mainstream of Life) ; ITI Fora in China, India, and Bangladesh (A Playwright's Meditation); WPIC in Athens ( A Country in Search of a Hero) Toronto ( Pepe), Jakarta and Mumbai ( A Significant Life). She worked as associate artistic director of the Cultural Center of the Philippines (CCP), associate professor, De La Salle University (Manila), professorial lecturer, University of the Philippines Baguio, and executive director of the National Commission for Culture and the Arts (NCCA). She now devotes her time to creative work in drama and poetry. Nobumitsu HAYASHI is General Manager of Hyogo Performing Arts Center (Yutaka Sado, Artistic Director) in Nishinomiya, Hyogo. Mr. Hayashi joined Asahi Broadcasting Corporation, Osaka, after graduating from Kobe University (business administration), and was in charge of self-organized concerts and musical projects at The Symphony Hall, Osaka, for 21 years from 1982, finally as Executive Producer. In October, 2003, he was appointed the current position before its opening to public in 2005. He is one of the co-authors of Theatre Who Sells the Tickets Out: Hyogo Performing Arts Center’s Journey (Suiyosha, 2012). Native of Kobe, Hyogo, Mr. Hayashi also serves Kobe University as lecturer. SUBONO BLACIUS, S. Kar, M. Sn. Subono Blacius comes from a family of respected Dalang or Shadow puppet-masters. From the age of 12 years, he has started performing on a world stage. Better known as Pak Bono, he is a figure of authority when it comes to gamelan. Pak Bono has travelled extensively to Asia, Europe and USA to perform and conduct workshops on this uniquely Indonesian music form. He has been involved in many small to large scale Indonesian music, dance and theatre productions, including the hugely successful Javanese Opera, Matah Ati. Pak Bono is sought after for his contemporary compositions and music arrangements for gamelan music for dance, having collaborated with renown Indonesian choreographer Sardono W Kusumo. Through his numerous collaborations with Indonesian and foreign artistes on music genres ranging from classical Javanese to pop to Jazz, he has helped make gamelan relevant in today’s music scene and other forms of performing and visual arts. One of his latest works used text from the Bible for macapat or Javanese style poetry reading accompanied by his fresh gamelan music arrangement. It has received very good reviews. Pak Bono is truly a visionary who is always on the look-out for new ways to present gamelan. Sanjoy K Roy established Teamwork Films and Teamwork Productions in 1989, a highly versatile production house with wide ranging interests in the performing and visual arts, social sector, and films and television. As the Managing Director of Teamwork with offices in Cairo, Chicago, Hong Kong, Johannesburg, London, New Delhi, Singapore, Seattle, Tel Aviv and Vancouver, he designs and produces 23 annual Arts Festivals across these countries and beyond. Sanjoy is currently the Festival Director for Shared History Festival in Johannesburg and Durban, Eye on India – Chicago and Seattle, Celebrating India – Jerusalem and Tel Aviv and producer of the Jaipur Literature Festival, META – The Mahindra Excellence in Theatre Awards, Kalaa Utsavam – Singapore, Kahani Festival, India and The Ishara International Puppet Festival. Having directed, produced, and toured over 50 productions and 1,000 films, documentaries and television programmes around the world, his works have won him prestigious awards including the Herald Angel Award and the Spirit of the Fringe at the Edinburgh Festival, and the National Award for Excellence and Best Director, for the film `Shahjahanabad The Twilight Years’. Sanjoy was Director for the Closing of the Commonwealth Games Arts Festival 2006 in Melbourne and advisor to The Kennedy Centre’s Maximum India Festival. He is a founder trustee of Salaam Baalak Trust that provides support services for street and working children in the inner city of Delhi and the Ishara Puppet Theatre Trust, and advisor for the arts for numerous governmental organizations across the world. (Director General of Culture and Tourism Bureau, City of Yokohama） Joined Nissan Motor Co., Ltd. in 1982. Has served as the head of the Planning Management Dept., Director of the Brand Management Office, and Deputy Director of the Brand Coordination Division. After serving as the Director of City Brand Promotion Office, Culture and Tourism Bureau, City of Yokohama in 2011, she took up her current position in 2012. 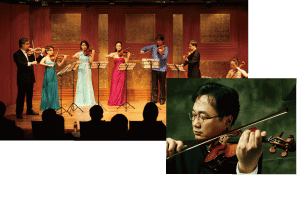 Erato Ensemble is a representative Korean chamber ensemble. The music director is world-renown violinist Sungsic Yang. He won a prize in Long-Thibaud International Violin Competition in Paris, Paganini International Competition in Genoa, and International Violin Competition of Indianapolis. Also, he won the first prize in Carl Flesch International Violin Competition. He is currently working as a professor in Catholic University of Daegu. Considered as one of the pioneers of contemporary Filipino Theater in the Philippines, the Philippine Educational Theater Association (PETA) has produced more than 400 plays, mostly originals and in the language, outlook and spirit that is Filipino, tackling issues relevant to its audiences. Mr. Chen Jun is the first class instrumentalist in Chinese People's Liberation Army Orchestra, and the vice president of the erhu association of the Chinese Music Association. Ms. Liu Ke is a renowned pipa performer and the artistic director of Erhu Road. Ms. Jun Zhi Cui is the pioneer of the modern Chinese instrumental arts of Konghou performance. 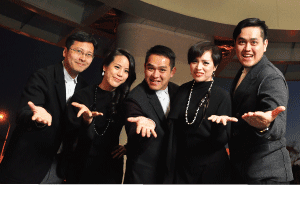 The O-KAI SINGERS won the top award in the Taiwan International Contemporary A Cappella Competition after just two months of their foundation, and have been frequently invited to perform at various A Cappella events worldwide. The Bedhaya Dancers will perform Bedhaya Matah Ati, an ancient and sacred dance form from the courts of Java, which is performed by an all-female cast. Sethisak Khuon is the first western opera singer in Cambodia (Cambodian Tenor). Now he is the President of "Cambodia Voice Academy" and Founder of The Kingdom Orchestra and Angkor Opera Festival + Kingdom Opera House Projects. The last FACP Conference that was held in Japan was the 13th Conference in 1995 in Kobe. After 19 years, I am very happy that this year’s conference is back here to be held in Kawasaki. A lot of cultural and musical performances have been actively promoted in Japan, which is the ideal venue that reflects this year’s theme of “The Power of Performing Arts, Learning the Culture Strategies of the Asian Region.”Subtitle: Social Role and Network Formation of Art Performance in Asia / Japan’s Contribution. The keynote speaker for this Conference is Mr. Gareth Malone, who is well-known in the UK, has often been featured on BBC TV, and was highly distinguished by the Order of the British Empire (OBE) for his achievements in music. I would like to make this Conference a productive one as we discuss meaningful topics such as “ National Cultural Strategy ” , “ The Significance of Orchestra Development ” , and “ The World of New Art Developed by 8K- Technology ”. 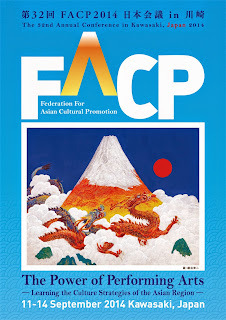 The Federation for Asian Cultural Promotion (FACP) has a long history of 35 years. Before, the FACP was only a friendly craft where friends gather together to share the same passion in music. But now, it is time for a change to a new era: a new scenario to accomplish FACP’s number one task. We have goals that we need to achieve in a professional way. We need to work together to build up an influential organization that can give the opportunity to educate children more about music. We need to encourage them to learn how to play musical instruments. If they can play very well, they can play everywhere. This will give them a bright career path and personal growth development. Music is very important for kids to grow up. I believe that good music has absolutely positive impact in building up a good human being. I feel that my duty as the Chairperson is that FACP will become the influential body in Asian countries. We are an organization which can give political influence to governments about culture policy making around Asia. FACP is the only association in Asia for this cultural socket. Based on our knowledge and experiences, we want to try to influence the government to increase their budget in education, music, and cultural activities. Performing arts, including music, has now become a cultural business. The key factor to success is making collaborations and giving contributions to the community. Let us continue to work together to achieve our goals of cultural promotion. I look forward to seeing all of you in the next Annual Conference.